(SJT04017) Life Isn't About Waiting for The Storm to Pass. It's About Learning to Dance in The Rain. Absorbent Stone Coasters, 4-inch (4-Pack) by SJT. at Fred Burg Country Dance. MPN: 04017. Hurry! Limited time offer. Offer valid only while supplies last. Decorate your home or office with coasters from SJT! 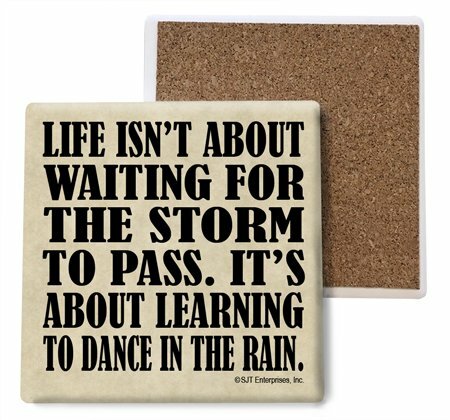 Life isn't about waiting for the storm to pass, It's about learning to Dance In The Rain design. Decorate your home or office with coasters from SJT! Life isn't about waiting for the storm to pass, It's about learning to Dance In The Rain design. Made from absorbent stone to absorb drips, spills and condensation. Coasters are cork-backed so they won't damage your furniture, counter, desk, or anywhere else you place your cup. Each coaster measures nearly 4 x 4 inches. All four coasters feature the same artwork. Proudly printed and packaged in the USA. This coaster set makes a great gift for friends or family! This coaster set makes a great gift for friends or family! If you have any questions about this product by SJT., contact us by completing and submitting the form below. If you are looking for a specif part number, please include it with your message.